Linchpin User Profiles are a key component of the Confluence-based social intranet platform, Linchpin. The app expands your native Confluence user profiles – contextually, visually and technically. This enables organizations to personalize the intranet's content and functions extensively based on certain profile features. Our development team has recently released Version 2.9 of Linchpin User Profiles. Here's what's new. Despite all of the digital tools and systems available, paper still holds a firm place in teams and companies, and it is definitely still justified in its existence. Quickly printing out a list to discuss with a colleague face to face or have to hand in a meeting are use cases we see in countless teams every day. Linchpin User Profiles now provides a solution for this use case and makes the switch from physical to digital seamless and efficient. With the press of a button, you can now export the contents of the "Profile" and "Custom User Lists" macros to PDF format, as a snapshot that is immediately available to print or forward. Not only do our development teams work to implement new features, but they continually strive to optimize our products' user interfaces, modernizing them step-by-step for an even more efficient, effective, and well-rounded user experience. The latest improvements in Linchpin User Profiles 2.9 include the "Profile" and "My Contacts" macros as well as the profile view itself. We have centered the profile contents to make it easier and faster to take in the information. In line with the current version of Confluence, profile pictures now appear in a round format, seamlessly integrated into the overall system. 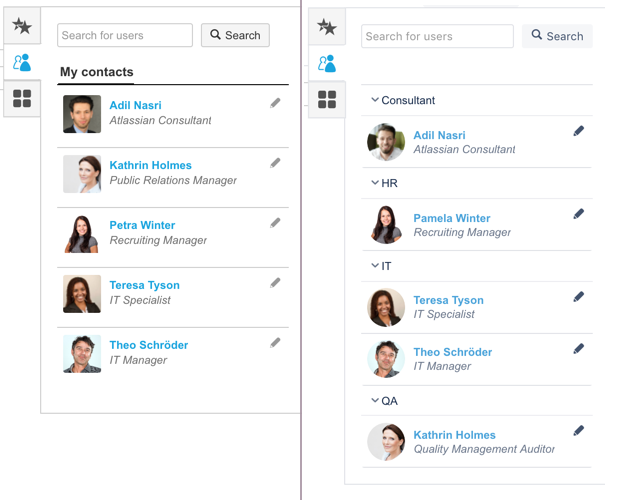 The "My Contacts" view in an earlier and the current version. Organizations need good software that is as efficient as possible. This not only includes how such tools work but their response speed, too. For this reason, the optimization of Linchpin User Profiles' performance is something we are always working on. For the new release, the team has made various adjustments to fine-tune the app, and the performance of the Custom User Search macro has improved noticeably. Headings are no longer displayed in blank fields in the profile. We have removed the double status icons that appeared when Skype for Business was integrated in the profile. Linked fields now display the link text rather than the URL. Profile pictures uploaded before installing Linchpin User Profiles will now have a correct link to the profile. Do you want to find out more about Linchpin User Profiles? Our info page has all the information you need on features, first steps, use cases, and prices. 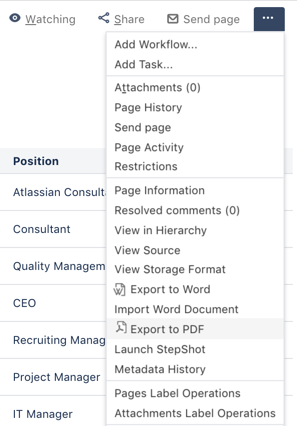 Of course, you can download the latest version of Linchpin User Profiles directly from the Atlassian Marketplace for a trial – or test it in a Linchpin demonstration instance, which shows you how the extended user profiles fit within a complete intranet system.